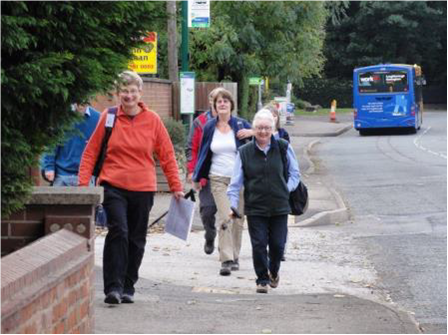 One of our aims in this group is that a good proportion of our walks are local and public transport friendly. This one ticks both those boxes and I would recommend it to anyone who feels the need to get out some fine afternoon. 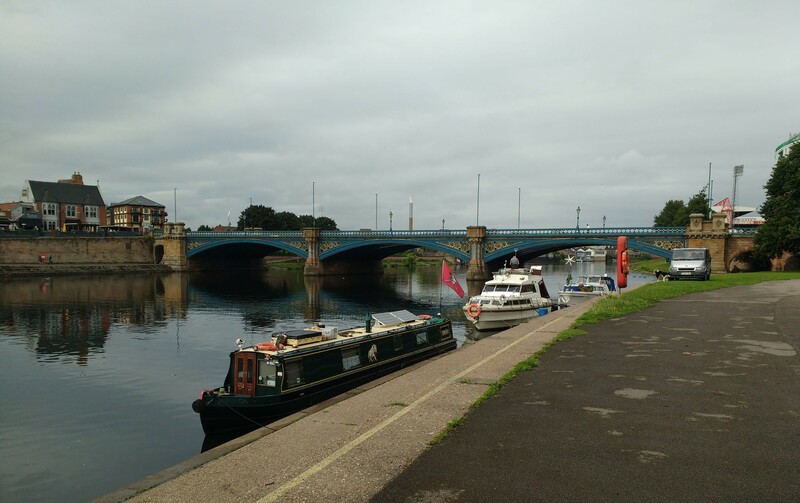 We started by the tram stop just over Wilford Bridge by The Ferry Inn and walked along the landscaped flood defence dyke towards Trent Bridge. We passed the graceful Suspension Bridge and continued under Trent Bridge so that we could gaze at the Forest Football Ground. We then crossed the bridge and went back down to the river by the Tannery Gardens and under the bridge where various flood levels of previous generations are engraved in the wall. The tea kiosk waylaid us before we continued along the more formal side of Victoria Embankment to visit the War Memorial and Gardens. One pleasure of our group is the mix of people who have their own history and recollections of these local amenities and newcomers to our area who welcome sharing in the local stories. We continued to Wilford Bridge that is now only open for trams, cyclists and pedestrians. You could have tea and a snack there at what was the old Toll House or, like us, return to the cosy and historic Ferry Inn for a good meal. In our last newsletter item, I mentioned that I am keen that a spirit of adventure and exploration should be at our core, whatever the length or location of our walks. Our May walk in Bradgate Park was on the more demanding side and, having ascended some height from the car park, we sat around and enjoyed the view. It seemed a good time to consult and gather ideas and there was the suggestion that we should have more walks further afield, perhaps alternating with local public transport friendly walks. This raised the issue of extra time needed to recce such walks and others offering to lead their suggested walks. 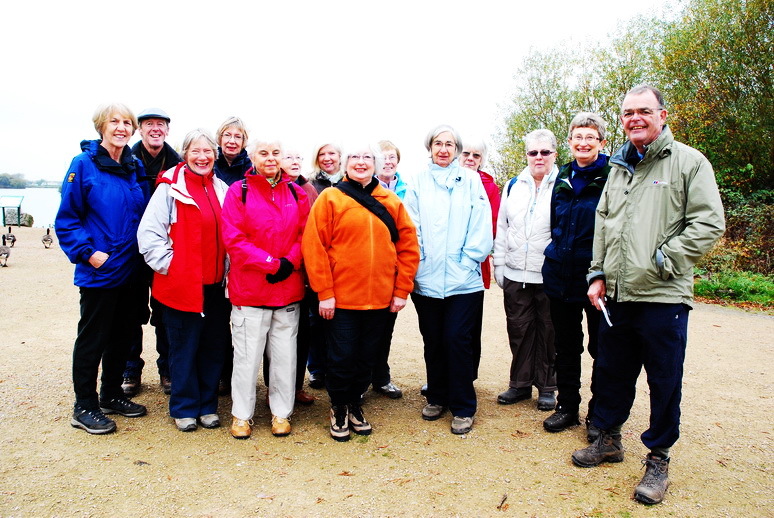 I have also had enquiries from new U3A members who had hoped that walks would be more local and more frequent. Might we expand our leadership team to keep our ideas fresh and meet these expectations? While we were having our discussion a passing walker offered to take a group photo so that we could all be on it. 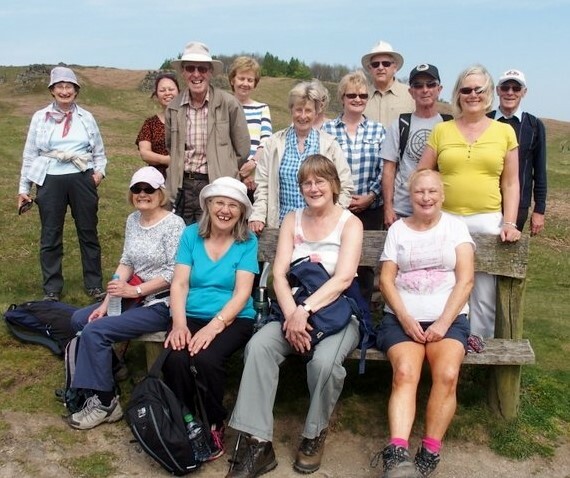 It turned out she was a Leicestershire U3A member out on her own building up fitness so she could resume walking with her group. She left us with a good memento of a lovely walk. Sunshine and Mud. The Ramblings of the Short Walk Group. As a walking group we have been pretty lucky with the weather on our monthly walks over the last years. However we have a talent for finding mud! In the way that memory somehow logs negative things more strongly than positives I now have an internal map of the potentially muddy sections in all our local walking areas! For our 2015 Christmas walk, which finished at the Broad Oak in Strelley Village, I was absolutely sure I had 90% cracked avoiding mud, the particularly cloggy red clay mud of that area. Well it was 80% avoided but we found the exciting new ‘peril’ of standing water. However it cleaned our boots nicely. I wonder if we might come up with some adjectives to describe the varieties of mud we encounter? The picture above is of the convincingly mud free recce of our Christmas Walk. The changing and/or less predictable seasons have also meant that we have had ‘Autumn leaves walks’ with no fallen leaves, ‘Snowdrop walks’ with the snowdrops covered by snow and ‘Bluebell walks’ with only a handful of bluebells to be seen so we are now more guarded in our walk descriptions. Still we have a laugh, good conversations and often a cheerful pub lunch. Our remit is for walks to be less than five miles and at a steadier pace than the medium and long walks groups, but I am keen that a spirit of adventure and exploration should be at our core. I appreciate other members’ willingness to lead walks and suggest new locations. I am sure you will find the group welcoming if you would like to join us. 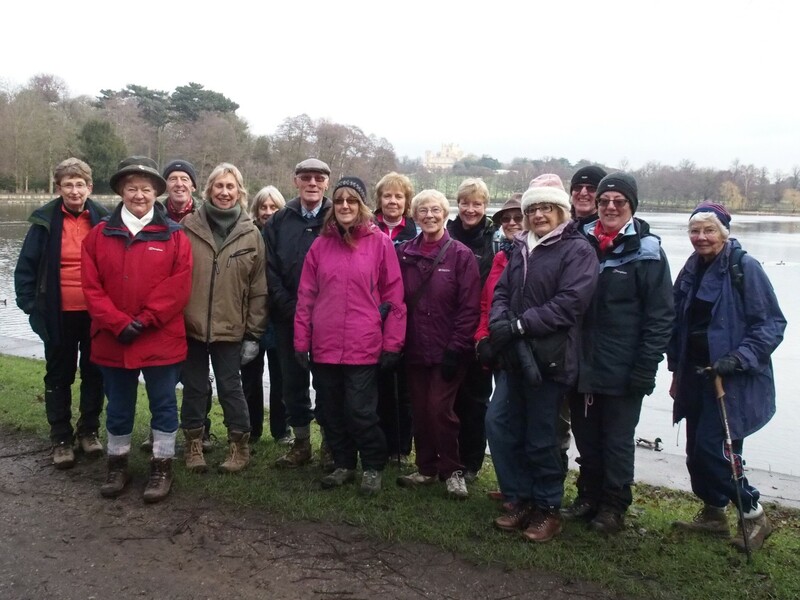 Picture above right is by the lake in Wollaton Park as part of our ‘Perimeter Wall’ walk in January. Despite my best intentions it is a year since I sent in a Newsletter item about the Short Walks Group so here is a resume of 2014. We have enjoyed a variety of new walks and consolidated areas we have already explored. 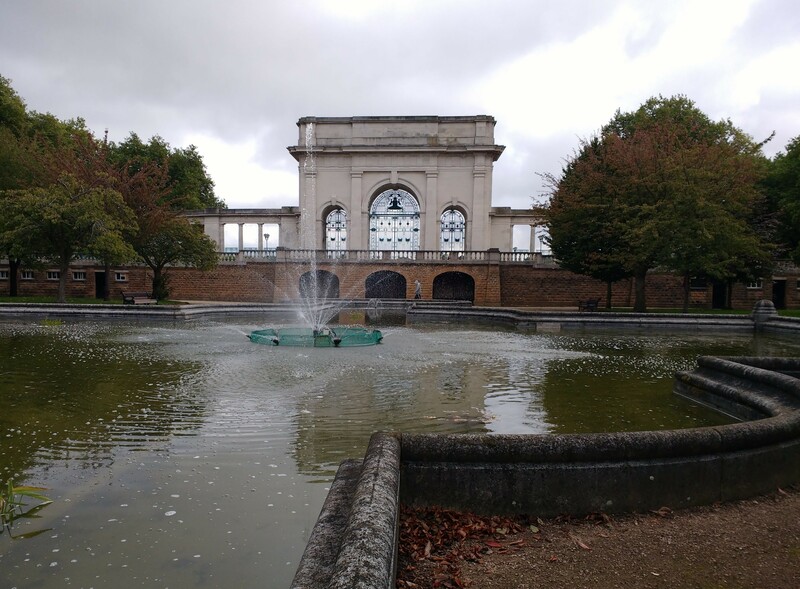 Peter Gurd inspired us with a zigzag route through Nottingham University campus taking in a range of ‘architectural’ features within the parkland. Joy Dixon-Smith encouraged us to explore the craggy grounds of Willersley Castle and follow the Derwent into Matlock Bath. I always enjoy linking up areas and paths we have walked which we have done by including Oldmoor Wood in our Christmas walk and in March we will link through from the Erewash Valley up to the Nottingham Canal. We have walked down from King George’s Park to Bardills and from Attenborough into Toton Sidings. The walk from Phoenix Park tram terminal led by Judith Couch was a highlight of my year taking us through areas I normally just drive through without a thought. 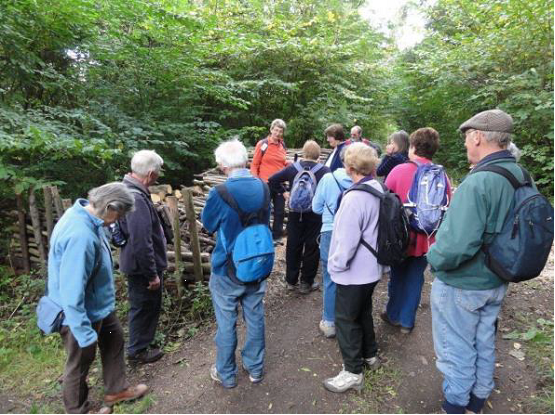 Some of our members have lived in the area for years and enliven our walks with reminiscences and facts. Others have recently moved into the area and are pleased with the access and paths we enjoy. Our mailing list is about 60 and attendance on walks averages about 15. A gentle two and a half mile walk to start the year with an extension if you feel the need! We will cover some sections of the deer park as well as the more formal garden area. There are hot drinks and toilets in the Courtyard café area. Meet at 10.15 for a 10.30 start. Meet in the car park nearest the vehicle entrance of Wollaton Road just after the Wheelhouse if approaching from Nottingham. Car park charge is £2.00 for up to three hours. Bus: NCT 30 service runs every 20 minutes. Entrance to the Wollaton Hall is free if you want to look round after the walk. We organise walks once a month, rotating days Monday – Thursday in the week after the first Thursday Open Meeting so that members without internet access can obtain details of the planned walk. Walks are usually morning or afternoon and there is often the option of a pub lunch or an afternoon cuppa. Where possible we try to make walks public transport friendly otherwise it is up to members to organise a lift if they need one. Walks are between three and five miles and details include mention of stiles if they occur, as they can be a problem for some members. 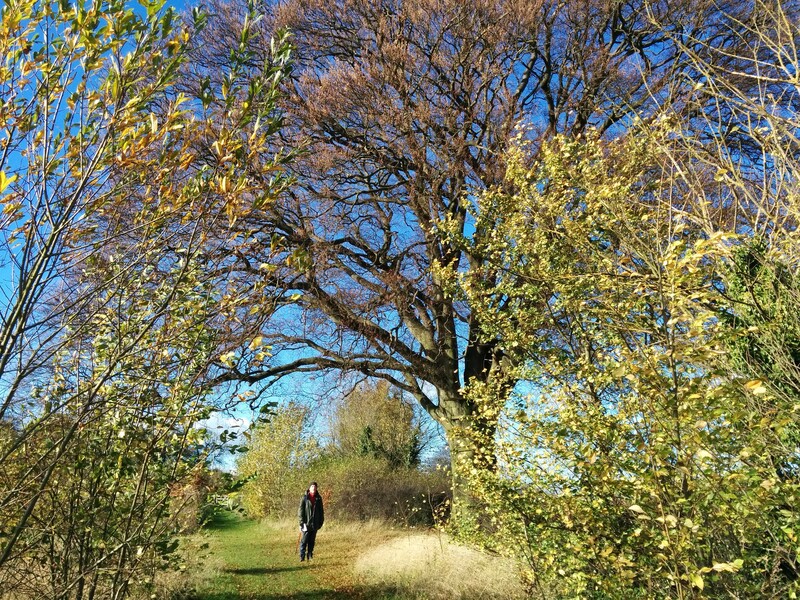 In October we had a delightful walk in Bunny Old Wood although the promised autumn leaves were determinedly green. (photo left) The public transport enthusiasts gathered in Broadmarsh Bus Station and caught a zippy Kinch Bus to Bunny. (Photo right). The forest tracks were easy walking and the ascent worthwhile for the views of open country. Our November walk was led by Ron and Margaret starting at the Risley Park Pub towards Ockbrook and circling round behind the picturesque Hopwell Hall. Stiles were numerous but the sun shone and the views were stunning although on this occasion my camera failed me. I am just back from a town walk where we enjoyed sunshine and avoided the showers. The desire to make walks accessible by public transport inspired this walk in Nottingham. We met at the Station Street tram terminal where several of us ate our sandwiches and admired the new bridge for the tram link, almost complete, in its construction over Midland Station. We then walked to the canal side ‘plaza’ in front of the Magistrates Court and admire the regeneration of that area and continued into the ‘Star Trek’ environment of the Tax Offices concourse before rejoining the canal side path towards Castle Marina. At that point it was a little breezy but a drinks stop was planned at The Hungry Horse and by the time we emerged the sun was shining again. We went into The Park Estate and enjoyed the tree lined roads and the impressive Victorian architecture before making our way round the back of the castle and pausing at Standard Hill where King Charles raised his Royal Standard in 1642 at the start of the Civil War although didn’t quite raise the army he hoped for. As a contrast our next walk will take us into a rugged (relatively) area of Derbyshire countryside. On that occasion we will travel by car and park at Black Rocks above Cromford. Our aim is to make our way past the rocks to a trig point at 322 metres for a coffee stop (bring a flask) We will then descend over the common through the forest to the High Peak trail where we will enjoy the views and make our way back to the car park at the pace of the slowest. The picture is from our reconnoitre of the walk. The group enjoys an average attendance of about 12 people with core members and those with other commitments who come when they can. Newcomers are welcome. Here is the short Walk Programme for April, May and June 2013. Walk 21: Thursday 11th April 2013. Bramcote Leisure Centre – Bramcote Ridge Circular. Meet at 10.15am for 10.30am start. 3½ miles. This circular walk is just over three miles through parkland; an ancient hedged byway; Bramcote Ridge and some residential roads. Most of the paths are good although some short sections may be muddy after the recent wet weather. There are no stiles. Walk 22: Monday May 13th. Nottingham Canal Circular. Meet:1.30pm. 2½ miles. This walk will start at the Tram Terminus at Station Street by Nottingham Station. We will gather in the sheltered area at platform level by 1.30 (Trams from Wilkinson Street are every 6 minutes and take 17 minutes or 5 minutes from Slab Square) Alternatively meet by the fountain outside the Magistrates Court at 1.40 but let me know you are joining us there. We will walk along the canal and detour through the Inland Revenue Complex. A tea (mug £1.39) /coffee (99p) stop is possible at ‘Waters Edge’ Castle Marina before we cross Castle Boulevard and return through the genteel Park Estate passing Nottingham Castle and finishing in Market Square. Walk 23: Tuesday June 11th. Black Rock at Cromford. Meet 10.45am for 11.00am. 3½ miles. Please be planning a lift share for this trip, as several members do not have their own transport. The car park is well signed from the B5035 a left turn at the junction from the A6 at Cromford. It is 25 miles from Bramcote and you need to allow about 50 minutes for the journey. Meet by the Information Centre and toilets. Black Rock is a Grit stone outcrop and the walk will take in areas of Cromford Moor and High Peak trail. The paths are well maintained. One or two sections are steep but we will enjoy excellent views of Derwent Valley. There may be one or two stiles. I suggest a picnic lunch so that we can take our time on the walk. Individuals can visit Cromford Mill or Masson Mill for afternoon tea after the walk. o We aim for company, exercise and fresh air but for some, knees, ankles or lungs don’t quite perform as they used to and the pace and terrain needs to accommodate these facts. o Predominantly our walks will be local and we will discover the treasures in our own back yards and hopefully many of us will contribute with local knowledge and favourite walks. o There is something special about high up places and getting away from the city so we will also include walks in Derbyshire and Leicestershire. o Where possible walks will start from points that can be reached by public transport. However for flexibility and scope I hope we can build up a system of lift sharing. We now have over 80 people signed up to this group and the numbers on the walks have varied between 20 and 30, which has seemed ideal. We walk once a month and rotate days. As a new group has formed for walks 5- 8 miles I suspect one or two will gravitate towards that so we will have space to welcome additional members. To get us started I introduced members to the walking possibilities in Bramcote Park that I had got to know when I took my children to Primary School. The area around the Hemlock stone has improved paths and the rubbish tip that was opposite Bramcote Crematorium is now reclaimed and has been planted with a variety of trees. The walk was two and a half miles but fairly hilly. Afterward we enjoyed the hospitality of the Sherwin Arms. Our second walk was based around my lunchtime walk when I worked at Plessey Beeston. 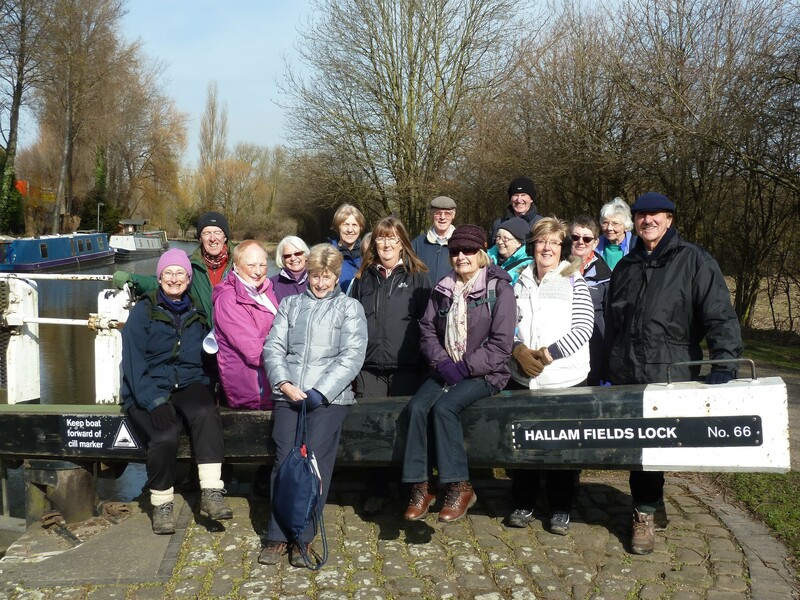 We started at Beeston Lock and walked along the river Trent towards Nottingham and then back along the canal. The scenery was quite stunning with the trees from the Clifton side reflecting in the water and the cornfields approaching golden ripeness. That walk had a convenient short cut for those who wanted more time at the friendly ‘Boathouse Café’. CONT..
John Stafford led our third walk when, starting at the Carpenter’s Arms, John led us around a local but secluded beauty spot at Dale Abbey. There is scope there for many further walks. The next walk on September 11th will start at Cromford Wharf, near Matlock at 1.00pm. It is possible to get there on the Trans Peak bus, which should be at The Nurseryman at 11.20am. This walk will be nearly five miles, ascends over 500 feet and is steep in places. Members of the group on email will get full details otherwise ring me, Ann Hart on 928 8413. Walk – 9 November – This was a pleasant leisurely stroll – circular – from Attenborough Nature Reserve to Trent Lock returning via a different route. We had 15 walkers of varied abilities and the first highlight was when Dave spotted a kingfisher near the first bridge. As you can imagine it was just a flash of blue so that was a good start. We followed the River Trent and looked at all the new environmental developments along the route. Eventually we reached Cranfleet lock passing by the Nottingham Yacht Club with Redmile rail tunnell being dwarfed by the steamy towers of Radcliffe power station. We arrived at Trent Lock after two and half hours walking and stopped for an hours refreshments at the Award Winning tea shop and the new Trent Lock pub just over the river. On our homeward journey we climbed Trent Meadows to establish a new viewpoint looking towards Gotham woods and the distant Newark. Someone claimed they could see Lincoln Cathedral but as it was a dull day we discounted that speculation. However is was established that indeed the said Cathedral can be seen on a clear day from Southwell Church tower. Another discussion point was the bench duly dedicated to Bing Crosby. We surmised that the American singer had probably never visited the said seat but that the same named gent had possibly spent many happy hours relaxing and taking in the panoramic view. Bing’s real name was Harry Lillis but no one knew that fact. As we ended the walk we could see in the distance a lovely winter sunset overlooking the Nature reserve lake. It ended a very enjoyable day for all of us. Thanks also to Anne and Jim our overall walk leaders and to Anne (lunch club) who was an excellent back marker. She ensured that no one was left behind ! Douglas MacDonald – Walk Leader.